Are you looking for a one-click root solution suitable with your Sony Xperia device? If so, then check this step by step guide as we will be checking on how to easily root devices like the Xperia Z, ZL, SP, T, Tablet Z and lot more by using a new one-click root tool that has been made available for us. So, similar with Samsung devices, now you will be able to unchain your Android based Sony Xperia smartphone or tablet in a minute and without worrying about complex and risky operations. 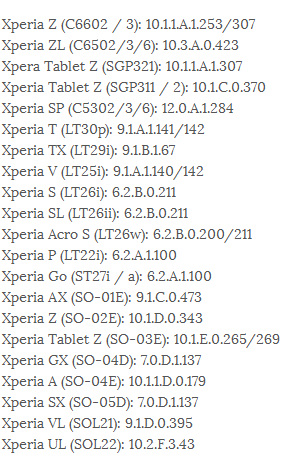 Actually you can root 21 Xperia handsets by using the tutorial described during the present lines while other Sony devices will be added to the supported list soon. But until then, the list from below is all we have and you should apply the one-click root solution only if your phone / tablet can be found on the same list. Else you can damage your device, or even brick it as after all, the root operation isn’t official and you will be making important changes into the internal system of your Android smartphone. As mentioned the root process is a complex one that has nothing to do with Google and in our case with Sony. Therefore, you need to use custom procedures for gaining root access. In a few words by rooting the system, you are removing the factory restrictions and default settings for accessing the OS and the internal system. After unchaining your Sony Xperia handset you will be able to improve the performances, install apps that requires root access in order to work properly, update with custom ROMs, overclock, upgrade the battery life, remove in-built programs and so on. Now, before heading to the root procedure, you need to read the guide lines from below and apply the pre requisites mentioned during the same lines. The warranty of your handset will get void, so be careful in what you apply and try not to mess things up – use the steps from below, don’t perform things by yourselves. The warranty can be restored as soon as you downgrade to stock Android OS, or when updating with an official release of the Android system. Also, a un-root method will work. You should backup the data from your device’s internal storage memory. Usually, when dealing with such operations the data gets wiped out or corrupted and you can lose all of your personal data, info and accounts. So, the best will be to avoid these situations by completing a backup in advance. For the backup I recommend you to use suitable backup and restore apps from Google Play – if you don’t know which app to use, search through our website for suitable tutorials or use the comments area from below for asking more details. Even though we are dealing with a one-click root solution, a computer or notebook is still required. You will install and run the tool from your computer, so your Xperia device and its USB cable are also required. Since you will connect the devices, first enable the USB debugging option on your phone / tablet by heading to “Settings -> Applications -> Development -> USB debugging”. Even though the root process will take only a few seconds, it is still recommended to charge your device, especially if you notice that there is less than 60% power left. Don’t forget to deactivate the security protection that is running on your computer because the antivirus tools might interfere with our work. Also, check the list from above in order to see if your Sony Xperia device is being compatible with this step by step guide; if not try to use a guide that has been developed only for your phone / tablet. As already mentioned, first of all, you need to get the rooting package on your computer. In order to do so, go here and download the one-click root tool from the xda-developers page. Save the file on your computer, preferable on desktop. Then, run the root.bat executable file. Connect your Xperia device with the computer. Use the official USB cord for establishing the connection. Return to the root tool. Follow the on screen directions and root your handset. In the end, unplug the USB cable and reboot your phone. Good job you have successfully rooted your Sony Xperia smartphone / tablet by using one-click root solution. How things worked for you? Were there problems or issues? If so, try to use this guide for resolving the same or use the comments area from below for sharing your thoughts and experience with our team or with others who might need and want to use this tutorial. Well, that did a whole lot of nothing. "You should backup"..."completing a backup in advance". "First, you should root your device as you cannot install ClockWorkMod Recovery on an un-rooted handset"
Are you actually trolling us? Nobody cares about these comments and questions below..
What if I've already upgraded my phone beyond the version listed above? How could I verify if this procedure will still work? how long is it supposed to take? It won't go further tan "started succesfully"
Hey there, I want to root my xperia z c6603 but get completely lost when they start talking about flashing and other technical stuff that I don't understand... on No 2 above you say go here go download the file but when I click on the link there is SO much going on on that site page (for someone that's not an expert) that I battle to even find the file I'm supposed to download... honestly I browse on the page but got NO IDEA of what to do... please post a ROOT FOR DUMMIES version. (I'm not afraid to admit), even a couple of screen shots will help ! Am I alone on this? Hey, i hav xperia z c6602, build number 10.4.1.B.0.101,what sud i do to root my device. Hi, I have a Xperia sp running on 4.3 at. 201 build.. So, if I use this one min tool... Will it be sufficient or do I need to do something else? I have a tablet Z, SGP311.. But updated to 2.2 therefore my build number is now 10.3.1.C.0.136 .. Will this method still work okay? what can you do if nothing happens after *waiting for your device* ??? How to root my Xperia Z C6602 using MacBook Pro?